CLICK ON PICTURE TO SEE A LARGE TRIPLE IMAGE OF ORIGINAL POINT! Approximately two thousand years ago, in what is now Tazewell County, Illinois, an artisan made this Hopewell point to include in a cache. It's generally believed by all who have studied the points in this cache that whoever made them had developed his flintknapping skill to the highest level attainable for his time. Dr. W. H. Holmes was the head curator of Anthropology at the Smithsonian Institution when the Mackinaw-Aldrich cache was found in 1916. He remarked that they were "the best examples of chipped flint work ever found in America." This is one of the better examples from this cache and to restore it's original form two very tiny restorations was done to the blade edge before the mold was made. 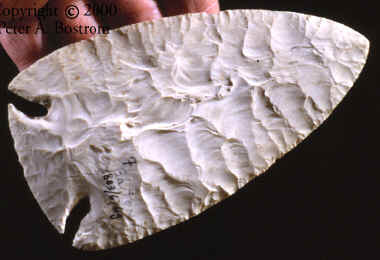 This point was made from white Burlington chert and measures 5 inches long and 2 7/8 inches wide.